“First, I would like to commend our host, Hof Ashkelon Regional Council Chairman Yair Farjun and the mayors and regional council chairmen, our friends from the south. It was your leadership and patience that gave us much strength to lead this campaign with responsibility, sagacity and great determination, as well as with considerable vigor, in order to restore security to Israel’s citizens. This was, and remains, our supreme concern. Since the establishment of the State of Israel, our hand has been extended in peace to those of our neighbors who want peace, and we have always fought vigorously, and with strength, against those who wish to destroy us, while building up our state, our cities and our communities – this is what we have done this time as well. We struck Hamas very hard. The IDF and the ISA killed almost 1,000 terrorists, struck at the heads of the organizations, and struck at their network of tunnels and their terrorist high-rises. We foiled their rocket attacks, and their aggression from land, sea and air. We hit their command centers and delivered blows that Hamas has not experienced since it was founded. At the same time, Hamas withdrew from all of its demands for a ceasefire, with neither time constraints nor other conditions. I hope that the quiet that has been restored will last for a long time. But we are ready for any scenario both in this sector and in others including – of course – the Golan Heights. We will continue in keeping with our Zionist heritage, to develop our communities and our cities. I use the word develop, not just rebuild, because we have already started to do that. We will make three decisions. Our first decision will be to assist – with a NIS 1.5 billion five-year plan – Sderot and the communities in the area adjacent to the Gaza Strip. The intention is not only to rehabilitate agriculture and repair damage which has been done but also to assist industrial, economic and agricultural development, and of course the construction of additional security infrastructures. This is the first commitment and it will be realized today. The second thing is that this month we will submit a similar package for the development of the cities and communities of the south. We are committed to them, we have always been committed to them. In recent years there has been accelerated development in the south; we want to strengthen it. The Zionist answer to those who seek our lives is not only to rebuff them and overcome them in any campaign but also to develop our state, in this case the communities in the area adjacent to the Gaza Strip and in the south, and to develop the Negev as a whole. The third thing that we will do today is to fill in the gaps. We will start to fill in the gaps that have been created in security. This reflects our understanding about the order of priorities in security is first and foremost. We have done very great things here but this requires us to make a redoubled effort to allow the IDF, ISA and the security arms to continue to efficiently protect the State of Israel. Israel and Hamas agreed on a ceasefire but still disagree on the implementation phases, the Al-Arabiya network quoted unnamed sources as saying Sunday afternoon. According to the report, Hamas conditioned the agreement on the immediate implementation of a ceasefire, while Israel wants to implement it in two separate phases – apparently a lull in the first stage and the lifting of the naval blockade of Gaza at a later stage. Four rockets were fired from Gaza at a Jewish community in the Negev. The Iron Dome missile defense system intercepted two of the four rockets fired at Netivot Tuesday evening. The others landed in open areas and did not cause any damage, according to reports. On Tuesday morning a rocket fired from Gaza that landed in a kibbutz in southern Israel struck an empty hen house. The rockets were fired despite an Egyptian-mediated truce between Israel and Gazan terrorist groups that went into effect on Sunday evening. More than 150 rockets fired from Gaza have struck southern Israel since the cross-border attacks began last week. Terrorists from Gaza fire a barrage of four Grad missiles at Netivot. Iron Dome intercepts two of them. Terrorists from Hamas-controlled Gaza fired a barrage of four Grad missiles at the town of Netivot on Tuesday evening. The Iron Dome system intercepted two of the missiles, and the other two exploded in open areas. There were no physical injuries and no reports of property damage. Despite an Egyptian-brokered “ceasefire” announced by Hamas last week, terrorists from Gaza have continued firing rockets at southern Israel. On Tuesday morning, a Qassam rocket hit a kibbutz chicken barn, causing damage but no physical injuries. A Grad rocket fired from Gaza landed in open land south of Ashkelon on Friday. Air raid sirens were heard before the rocket hit. No physical injuries or property damage were reported in the attack. The attack came after the Islamic Jihad announced a new cease-fire agreement in Gaza early Friday morning. The agreement was reportedly brokered by Egypt and the UN. The cease-fire announcement, made by Nafaz Azam, was unexpected as on Thursday Islamic Jihad had vowed to extend the range of their rocket capabilities, sending projectiles deeper into Israel. The terror group had said that it would triple the number of Israelis affected by rocket attacks. At least 17 rockets and mortar shells pounded Israel on Thursday evening, just one day after Wednesday’s barrage of at least 21 such projectiles. On Wednesday a 9-month old baby girl was wounded by shrapnel from a rocket. Most of the projectiles hit hit open areas near Ashkelon and in the Sha’ar Hanegev Regional Council. A mortar shell struck the Erez crossing, which is frequently used by Gaza residents seeking to enter Israel for medical treatments, causing extensive damage. Shortly after that attack the IAF reported a precise hit on a second terror cell seeking to launch a rocket in the area. Gaza sources said two Islamic Jihad terrorists were killed in the airstrike. The immediate breaking of Thursday morning’s Islamic Jihad ceasefire is no surprise in light of the mass of rockets that struck Israel immediately following the Hamas-led ceasefire announced on Sunday. Hamas, the Islamic Jihad and the other terror groups in the Gaza Strip declared another ceasefire with Israel late Thursday night, Voice of Israel Radio reported. According to the report, rocket attacks aimed at southern Israel’s communities will stop at 1:00 p.m. Israel time on Friday. The announcement came after at least 17 rockets and mortar shells were fired from Gaza on Thursday evening. The rockets and mortars exploded in open fields in Eshkol, the Sha’ar HaNegev Regional Council, and south of Ashkelon. The “Color Red” warning siren was sounded in the areas under attack. After 10:00 p.m., terrorists in northern Gaza fired yet another rocket at the western Negev city of Sderot. The rocket hit an agricultural facility east of the city. Thankfully, there were no physical injuries in any of Thursday’s attacks, which came after at least 20 rockets were fired into Israel Wednesday night. According to Voice of Israel Radio, the announcement of the latest ceasefire was surprising since only several hours before the announcement, the Islamic Jihad terror group criticized Hamas for suggesting that it stop firing rockets. The latest ceasefire, however, may not mean much, as the terror groups have declared ceasefires in the past and almost immediately violated them. In fact, the latest round of violence came after Hamas declared a ceasefire on Sunday evening. The Islamic Jihad used the fact that Israel killed one of its terrorists, who had been planning a terror attack in Gaza, as an excuse to launch a barrage of rockets at southern Israel. An Egyptian woman was injured when rockets from Gaza struck the border town of Rafah, and an Israeli airstrike killed a terrorist operative as cross-border fire interrupted a fragile cease-fire. Israel’s Air Force targeted the car of a local Islamic Jihad leader in Rafah in the southern Gaza Strip. The early Wednesday morning strike came after the Air Force struck Gaza terrorists preparing to fire rockets into Israel’s south. The dead terrorist leader reportedly was responsible for funding last week’s coordinated attacks on Israeli civilian vehicles. Later Wednesday, at least two rockets fired from Gaza struck southern Israel. A cease-fire reportedly negotiated by Egypt with Hamas and the smaller terrorist groups has been mostly holding despite the small breaches. Also Wednesday, an Egyptian woman was lightly injured when a rocket fired from Gaza landed in the Egyptian town of Rafah, striking a residential area, and not the desert, as has been the case in the past. Residents in the coastal city of Ashkelon raced for cover as the Color Red air raid siren blared its warning at about 7:40 p.m. local time. Two medium-range Grad Katyusha missiles, fired by terrorists in northern Gaza, exploded in the Hof Ashkelon Regional Council district. Both landed in open areas, although one set off a brush fire in a field that quickly ignited, dry from the summer heat. Earlier in the day, a rocket struck an empty building in the Eshkol Regional Council district as well. No physical injuries were reported in any of the attacks. The Popular Resistance Committees (PRC) terrorist group had announced earlier Monday in a statement on its website that it would adhere to a Hamas-led ceasefire. However, more than a dozen rockets were fired Sunday night after the so-called truce was imposed. No Gaza-based group took responsibility for the attacks. A deadly Grad Katyusha missile barrage on Be’er Sheva Saturday evening left a 38-year-old man dead and eight others seriously wounded. Ofakim was also targeted, as were numerous other southern Israeli cities and communities. Nearly 40 people were hospitalized due to severe anxiety. Palestinian factions in Gaza appeared to be observing a ceasefire with Israel reportedly brokered by Egypt. The Popular Resistance Committee, blamed for last week’s coordinated attacks near Eilat that left eight Israelis dead, on Monday announced a “temporary halt of rocket fire,” according to reports. Hamas reportedly agreed to enforce the ceasefire on smaller Palestinian terrorist groups in Gaza. Israeli officials told reporters that the ceasefire was unilaterally declared by the Palestinians. Still, Israel has not launched any retaliatory strikes on Gaza since midnight on Sunday. At least four rockets from Gaza were fired at Israel early Monday morning. One was intercepted by the Iron Dome missile defense system and one landed near a public building in Israel’s south, damaging the building. The ceasefire comes after a five-day barrage of rockets fired from Gaza on southern Israel, to which Israel responded to with retaliatory strikes on sites in Gaza. 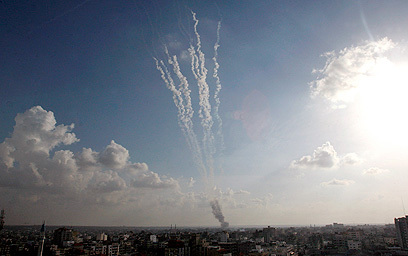 Twelve rockets were fired at Israel after the original ceasefire was to go into effect on Sunday afternoon.